I admit this recipe might not yield the healthiest sandwich, but it would definitely be in the running for being the most decadently delicious! 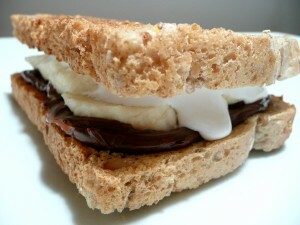 Nutella is an amazing chocolate hazelnut spread, and I add it to toasted bread and a marshmallow fluff spread. 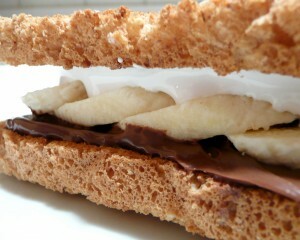 Sandwiched in between these sweets are soft banana slices that provide an extra level of creaminess to the entire dish. It’s messy, but really good, try it out! Taking one of the toasts, lather on the Nutella. Top it with the banana slices. On the other toast, lather on the marshmallow spread. Put it marshmallow side down on top of the bananas. Slice the sandwich in half, grab a napkin, and enjoy! Hi Stephen, I made your nutella marshmallow sandwhich for breakfast on Sunday morning for my daughter, Brianna and my husband. We loved it, it was a great hit. I toasted wheat bread and followed your recipe, delicious!